Israel's use of live ammunition in defense of its border with the Gaza Strip has caused an "unprecedented crisis" in the Hamas-run enclave according to a Red Cross official. 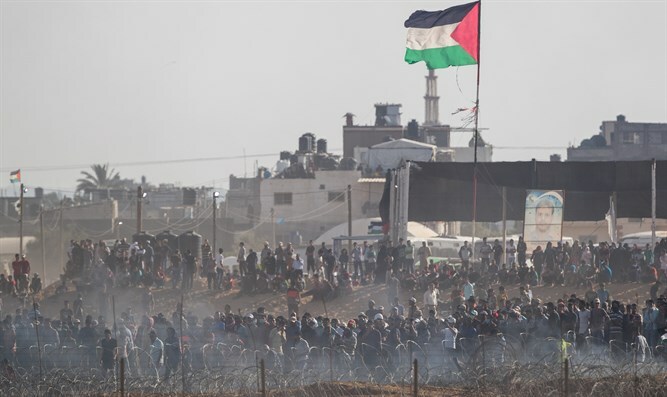 Approximately 132 rioters and terrorists have been killed on the Gaza border since large scale riots began in March. Many of those killed were attempting to breach the border fence and break into Israel or engaged in attacks on Israeli soldiers. The deadliest day of the riots occurred on May 14, when 62 rioters were killed. The Hamas terrorist organization acknowledged that 50 of those killed that day were members of the terror group. Approximately 13,000 people have been injured or wounded, according to the Hamas-run Gaza Health Ministry. Robert Mardini, the head of Middle East division of the International Committee of the Red Cross (ICRC), told reporters Monday that the "vast majority" of those hurt suffered "severe" injuries," including multiple gunshot wounds. "This is I think a crisis of unprecedented magnitude in the Gaza Strip," said Mardini. Terrorists from the Gaza Strip have continued to attack Israel in recent weeks, using kites and helium balloons attached to incendiary devices to set fire to Israeli land. Over 25,000 dunams (6,177.6 acres) of Israeli land - mostly forests and agricultural fields - have been scorched by the terror kites in recent months, while the perpetrators have gone unpunished. Extensive damage has been caused to Israeli crops, irrigation systems, wildlife, and forests.